Senator Barbara Boxer (D-CA) accused Senaor Lindsey Graham (R-SC) of being too “theatrical” during the Senate debate of the stimulus bill on Saturday. “It’s clearly a ‘gay insult,'” a gay friend told me. Lindsey Graham is not only theatrical, in a different party he could have been fabulous. Larry Craig, David Vitter, Mark Foley, Charlie Crist, J. Edgar Hoover – historically a gaggle of Republicans have raised eyebrows across Capital Hill. But if Boxer is speaking in some kind of code it is fascinating to imagine what will happen if she ups the ante every day until the Stimulus Bill gets passed. Because, frankly, Lindsey looks nervous. In other words, it spends a lot but doesn’t give us a lot of jobs. 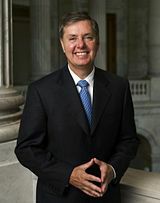 “I have reached across the aisle, I am for bipartisanship,” Graham said. Senate watchers and newsmen say it is doubtful that there will be a stimulus vote in the Senate on Friday night. Senate Majority Leader Harry Reid is trying to woo three Republicans to vote for the Democrat stimulus bill; but as of 5 PM Eastern on Friday he doesn’t have the votes…. President Barack Obama‘s massive economic recovery package teetered in the Senate Friday after hours of backroom meetings failed to produce an agreement that could attract crucial GOP votes. Meetings continued through late afternoon between Majority Leader Harry Reid, D-Nev., and key Republican moderates Susan Collins of Maine and Arlen Specter of Pennsylvania. Both hoped to pare back nonessential spending items in the measure, while a third moderate, Olympia Snowe, R-Maine, worked with Democrats to trim the bill’s $340 billion in tax cuts by perhaps $25 billion. Reid suggested in a conference call with Nevada reporters that he has two GOP backers for the bill but needs at least one more because neither wants to be the crucial 60th vote if all 58 members of the Democratic caucus support Obama. Obama kept the heat on, using his presidential megaphone — and the latest dire jobless numbers — to challenge lawmakers to act swiftly. Democratic leaders called a late-afternoon meeting of their members to discuss the latest proposal being floated by a bipartisan group of moderate senators. Reid reflected the fierce sense of urgency among Democrats and the White House amid the party’s fear that Republicans were turning public opinion against the costly bill. “The world is waiting to see what we’re going to do in the next 24 hours,” Reid said on the Senate floor, citing the bleaker economic picture. The small group of moderates were negotiating in hopes of cutting up to $100 billion from Obama’s plan. The latest version had ballooned to $937 billion on the Senate floor, with further add-ons possible during a long day of votes Friday. That’s what President Barack Obama said late Thursday. If we don’t what? Jam this down people’s throats? The President of the United States used that turn of a phrase? Just like he hauled “catastrophe” out of the verbal closet this week? The great communicator is in danger of becoming Joe Biden: a guy you don’t want off the script, off the telepromter. The fact is that the economy will continue downward, quick action or not, if previous economic downturns are any indicator. So, as is often the case, when an executive (or just about anyone else) is frustrated because he doesn’t completely believe the bill of goods he’s peddling, he makes mistakes with his words and gets even more angry. This isn’t anger to make a point: the president really is angry at Republicans who are telling him the stimulus is flawed, at Daschle for being a “limo liberal,” at the economy for robbing him of the money he needs to execute his camapaign promises, at Nancy Pelosi and the House for such a shoddy piece of legislation called “the stimulus” even though the stimulative properties are minimal, at China and others for screaming “trade war” over “Buy American”- a horrendously brainless child of Pelosi, at…well, the list goes on. Russia is working like the devil to close the U.S. air base that supplies Afghanistan from Kyrzykstan, in Pakistan those Afgahistan supply lines are under siege, Iran has launched a satellite into space, North Korea wants attention and threatens its own missile launch, and the Israelis remain unhappy with Hamas. Even Evan Thomas at Newsweek is calling Afghanistan “Obama’s Vietnam.” Already. And Barack Obama is at a Spa showing his anger to a Democrats only audience. No bipartisan working group there…. He should be talking turkey with Republicans and making progress on the stimulus: and that’s why Senator Lindsey Graham accused the president of being AWOL and of an inability to lead. President Obama should be watching the film “Dave” where the President really does roll his sleeves up (and not just for the cameras) and goes through the budget line by line. Taking more time, even a few days, to get the most appropriate and useful stimulus just might be a better idea than passing a stimulus that is a mess of pork a few days sooner. And the president cannot be working to solve problems in the stimulus while he is at a Democrats only meeing away from Washington DC in a Spa. This is the largest federal spending bill ever and there have been no hearings in committee. Economists are deeply divided on the very premise of the stimulus argument. And the bill developed by Nancy Pelosi and her House Appropriations Committee — without any Republican input — is a massive money give-away and not primarily a jobs bill. It is a spending bill. So the reason Barack Obama looks angry from time to time these days is this: he’s been cheated by Nancy Pelosi and the House and now he is trying to foist upon the American people something he knows and they know is not just less than perfect, its bad; but its also not as bad as Lindsey Graham thinks. If this is a “catastrophe” I’d hate to see what “No Drama Obama” calls a terrorist attack using nuclear or biological weapons (God save us). There are people out of jobs — a lot of people — but they aren’t dead. The stimulus package now calls for almost $900 billion in spending and the interest on the debt/loan could be $300 billion. “I like President Obama but giving TV interviews is not leading. Having lunch with people is not leading. Scaring people is not leading,” Senator Graham said. He said he was hoping to see the president get Congressional leaders together to make a better stimulus bill. “This is not bipartisan at all. I want to help the president on Gitmo, on the stimulus and on other things for our country but this is just a waste of time,” Garaham said. Senators John McCain, Joseph Lieberman and Lindsey Graham expressed confidence in the government of Pakistan today during a visit to Islamabad…. Pakistan understands it must take quick action against any terrorists connected to the Mumbai attacks that are living in the country, U.S. Sen. John McCain said Saturday after meeting its leaders. Indian authorities say the attackers were members of a banned Pakistani militant group that was set up by the country’s intelligence agencies to battle Indian rule in the disputed Kashmir region. The attacks have ratcheted up tensions between the nuclear-armed countries, which have fought three wars in the last 60 years. Asked about the possibility that India may take military action if Pakistan does not react to its allegations, McCain said he believed Islamabad would cooperate with India and take timely “specific acts to avert any further deepening of this crisis. “From our meetings we have had today we are encouraged that the government of Pakistan will show that cooperation in words and deed,” he told reporters after meetings with Pakistan’s prime minister and military chief. McCain came to Pakistan with two other U.S. senators — Joseph Lieberman and Lindsey Graham — as part of a regional tour as members of the Senate Armed Services Committee. They previously visited India. The attacks have triggered an intense round of diplomacy to stop relations between the two countries deteriorating, something Washington fears will affect its campaign against al-Qaida in the region. Earlier, the government denied reports that a man pretending to be India’s foreign minister spoke to President Asif Ali Zardari over the phone during the Mumbai attacks. She did not explicitly say that the call was from Mukherjee, but two other government officials said it was him. They spoke on condition of anonymity because of the sensitivity of the situation. Pakistan says it has yet to see any proof of New Delhi’s allegations that its citizens were involved in the Mumbai attacks, but is prepared to cooperate with India. It has denied any of its state agencies were involved, noting it too is a victim of terrorism. You are currently browsing the archives for the Lindsey Graham category.